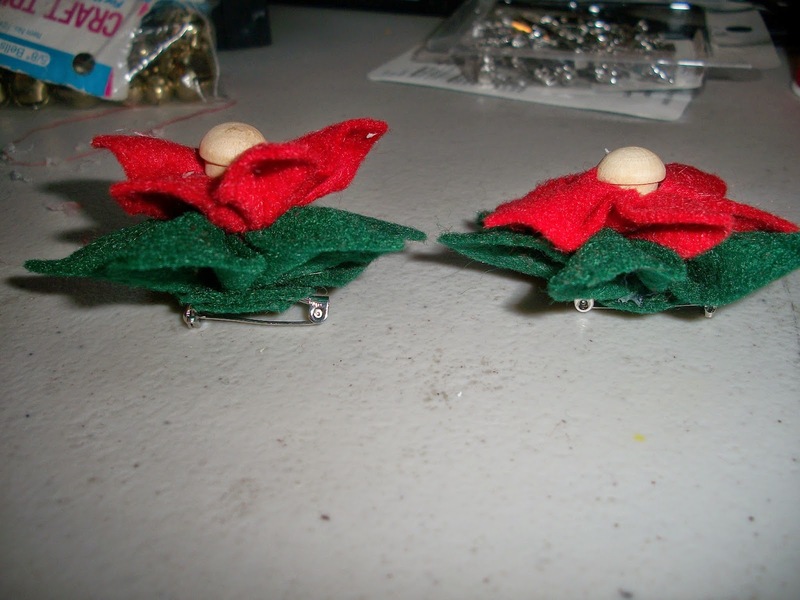 I found this tutorial on Pinterest a couple of years ago and bought a few supplies to make the poinsettias, but I ran out of time so I decided to try it out this year. 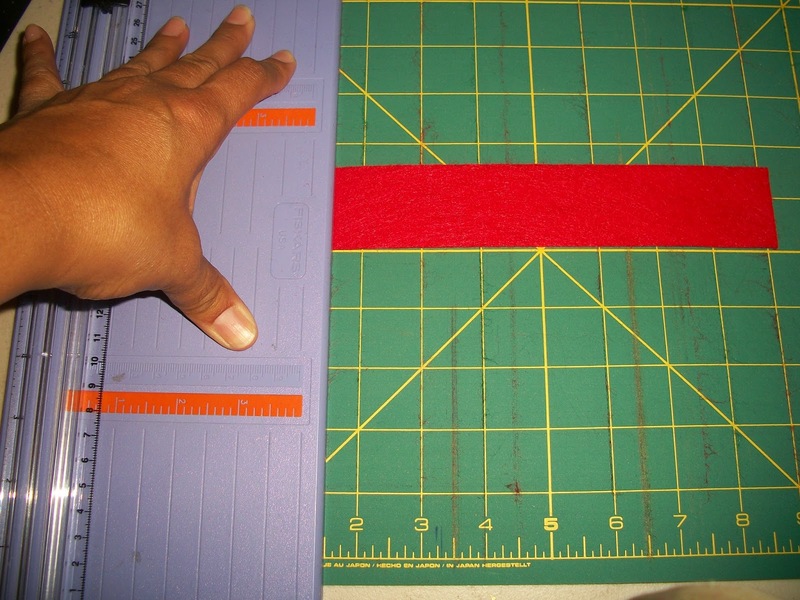 Reference the tutorial linked above for a supply list and the all sewing method. 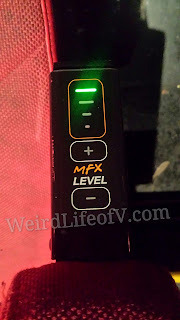 I am only adding a glue gun to the mix for my method. I also used items I had in my craft stash for the center accents: wooden plugs, gold colored bells, and acrylic jewels. 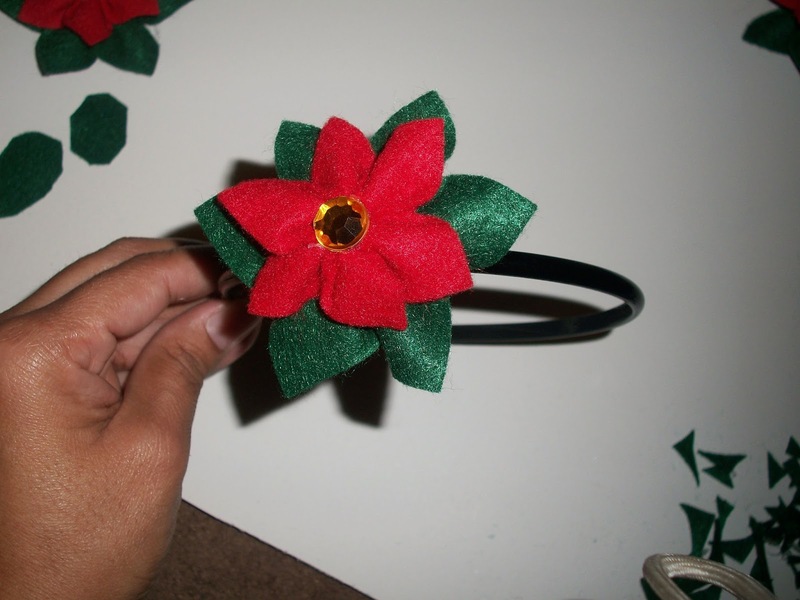 I had a few headbands purchased at my local Dollar Tree from a few craft projects last year. I also used these pin backs originally purchased as Michaels a few months ago for another project. 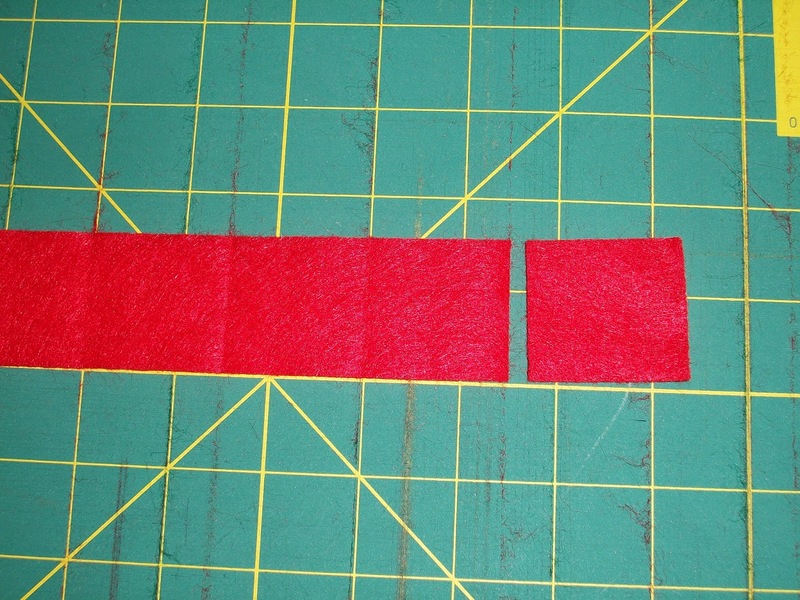 I tried the method in the tutorial referenced above (though I did glue the bottom felt circle instead of sewing), then tried hot gluing everything, then settled on a combination of both hand sewing and hot gluing. 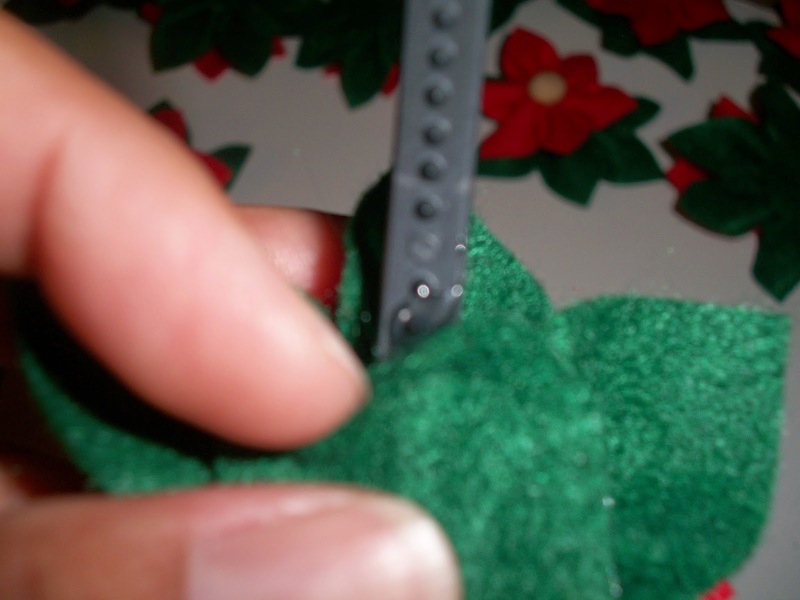 If you have the patience, and better sewing skills than I do, the all sewing method looks the best. 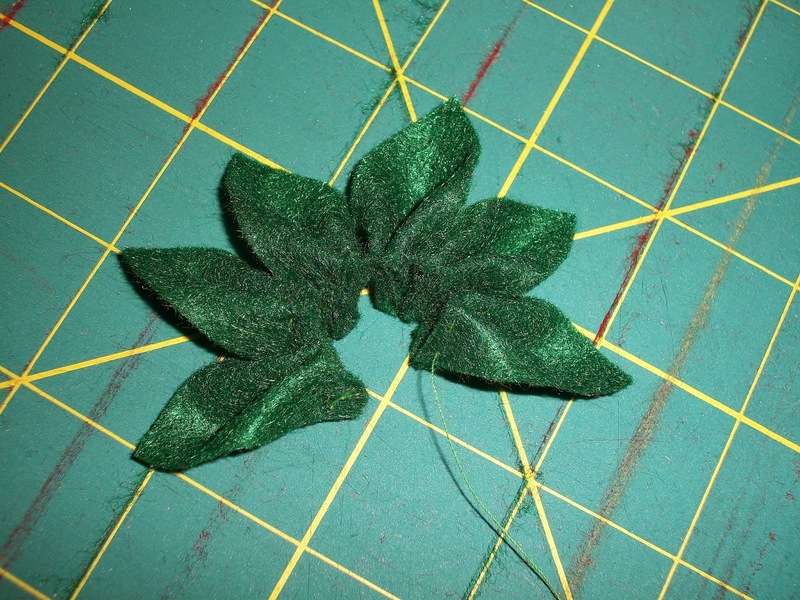 The problem with the all hot glue method is the flowers were very tall and bulky, but they were extremely fast to make. 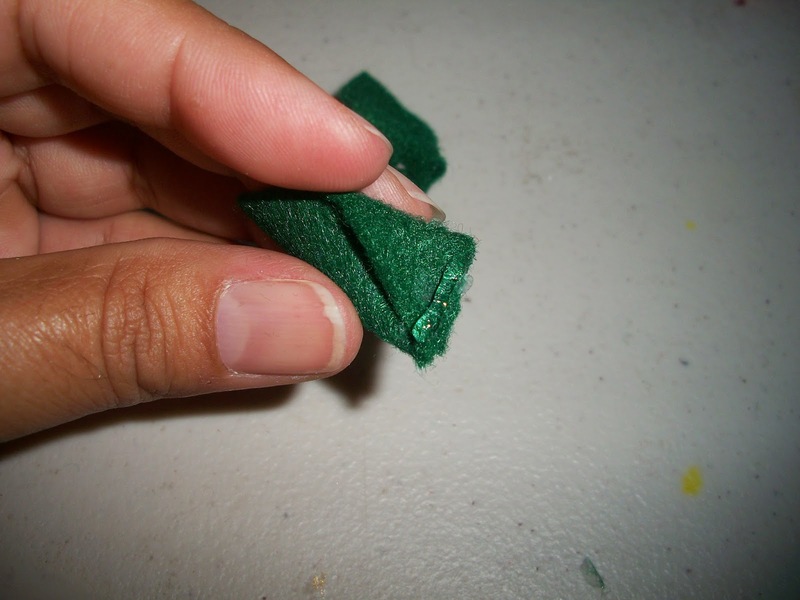 The half sew/half glue method gives you the best of both worlds. 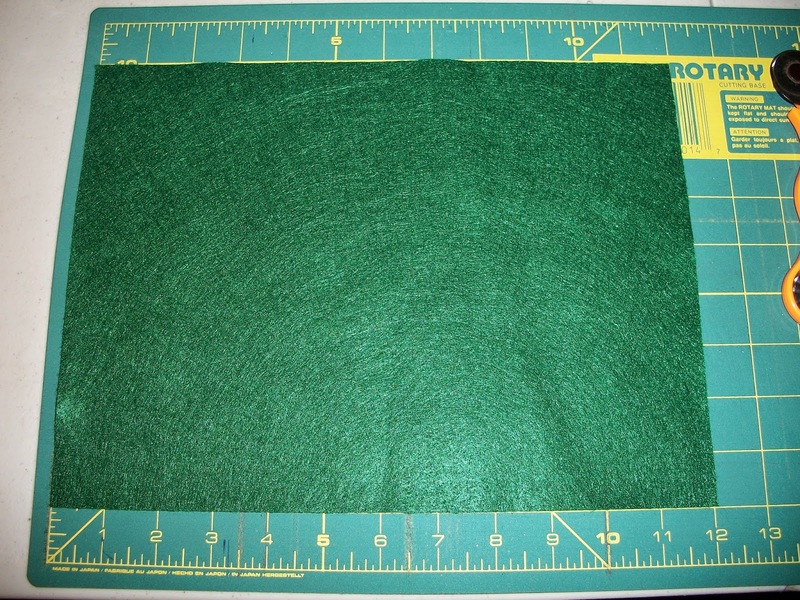 First thing I did is cut my felt sheets (9”x12”) into 2” green squares and 1 ½” red squares. 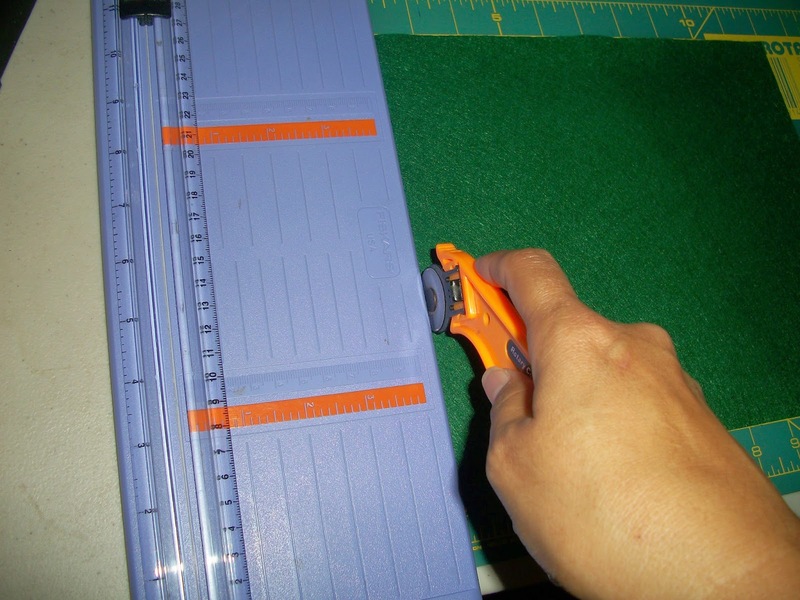 She mentions in the tutorial that you can cut them by hand and they don’t have to be exact (how true), but I found using a rotary cutter and cutting mat much, much faster. 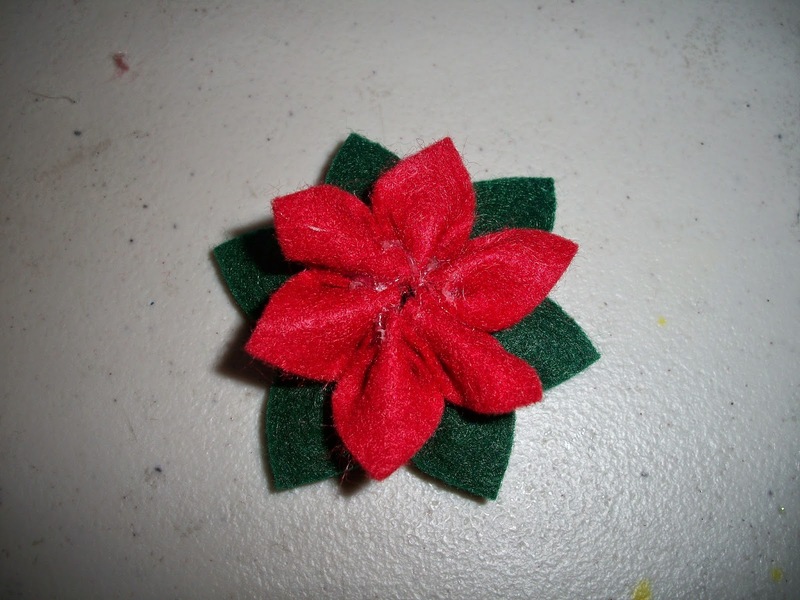 I am making these as little gifts for some friends, so I needed to make at least 12 flowers. 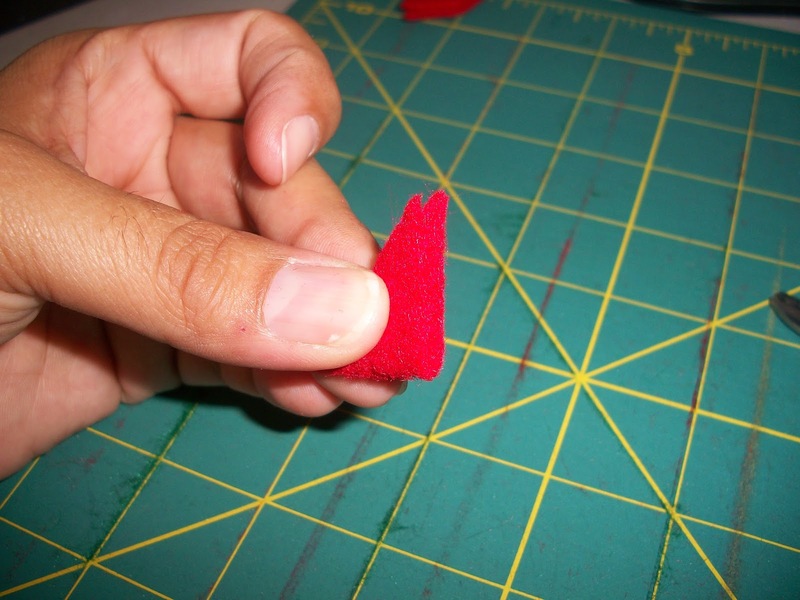 I did cut the squares in half to get the triangles and trimmed the triangles by hand (see the linked tutorial). 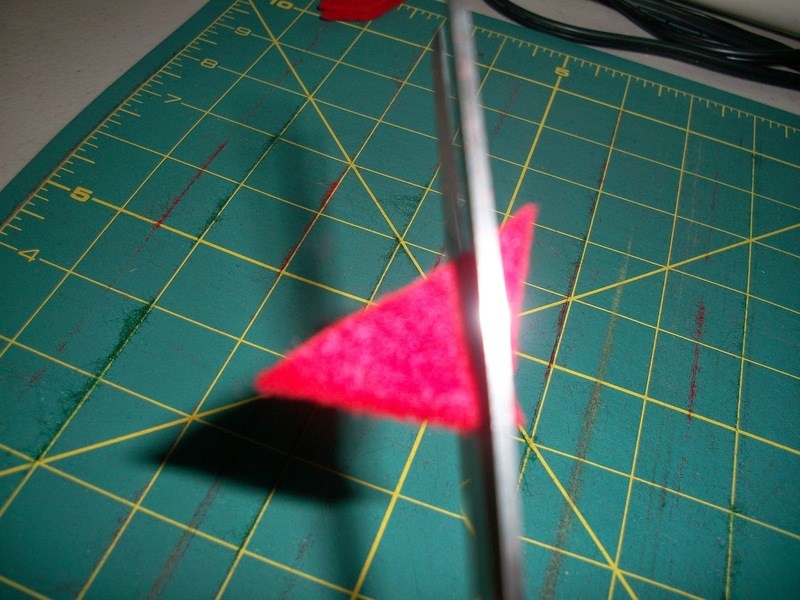 Working with one color at a time, fold one triangle exactly as shown in the original tutorial, but place a small dab of hot glue between each of the 3 folds. 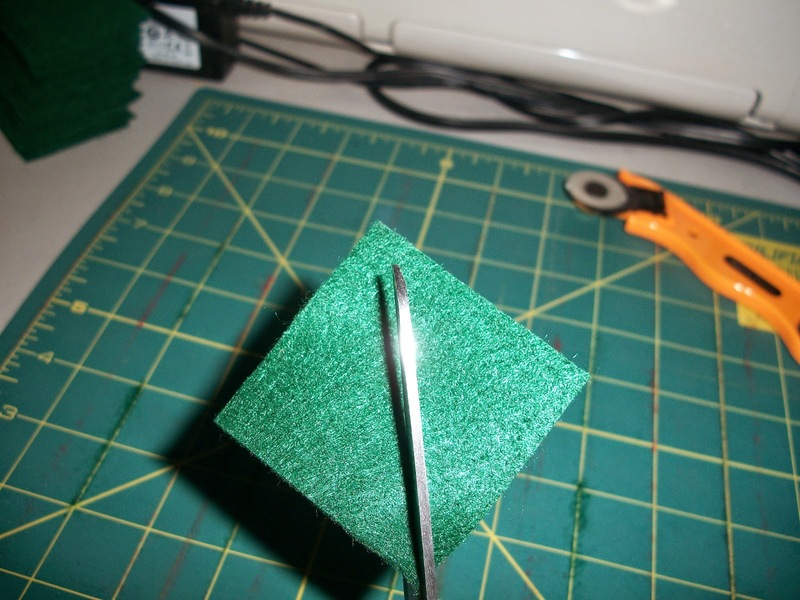 Hold until glue cools/hardens, then repeat for each of the 6 triangles. 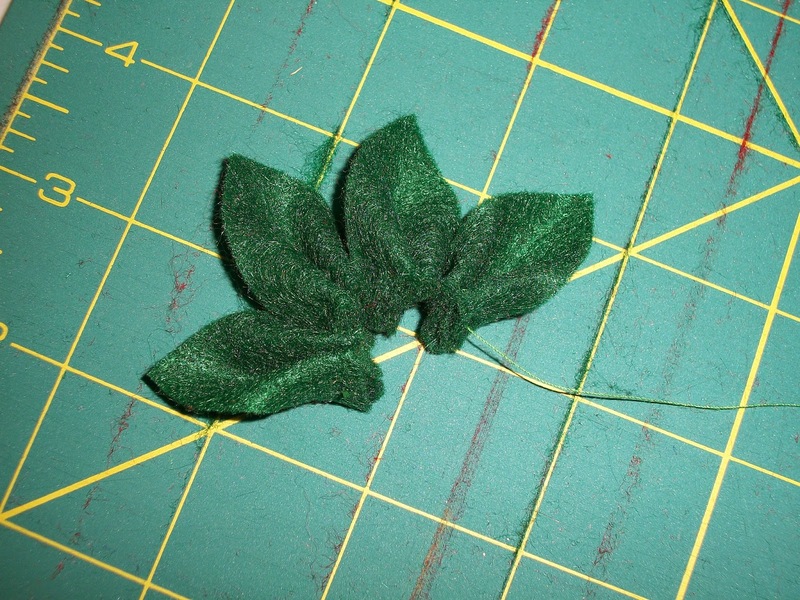 Place a line of glue at the pinched end along the outside of each leaf and attach to another leaf. Repeat until all 6 leaves are attached together in a circular shape. Repeat steps 1 and 2 for all of the other triangles. 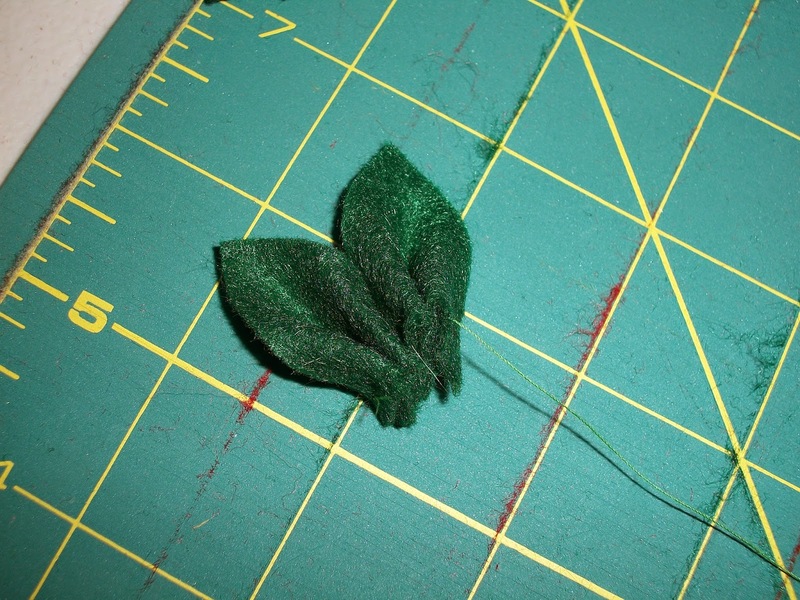 Place glue on the top of the green leaves along the center circle and attach the red leaves offsetting the leaves slightly so that the green and red leaves alternate. 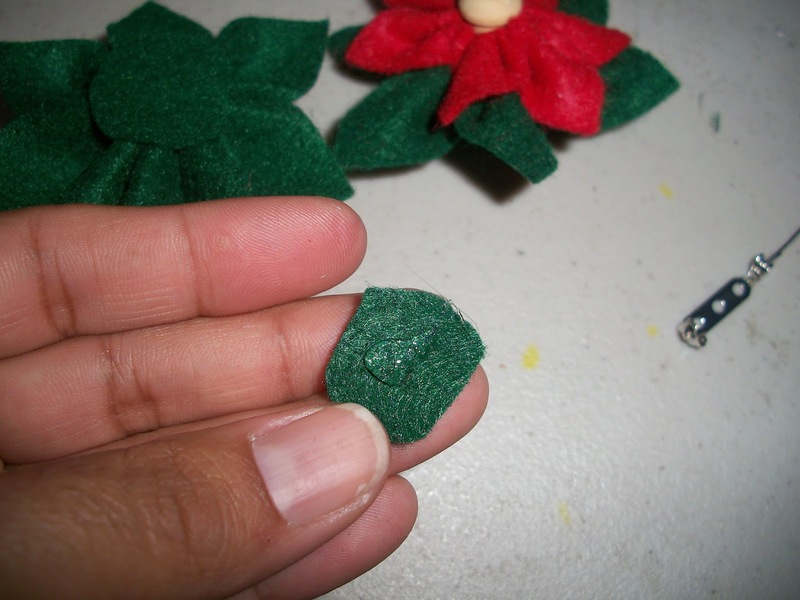 Glue the green felt circle to the bottom of the green leaves and glue the accent pieces to the top center of the red leaves. 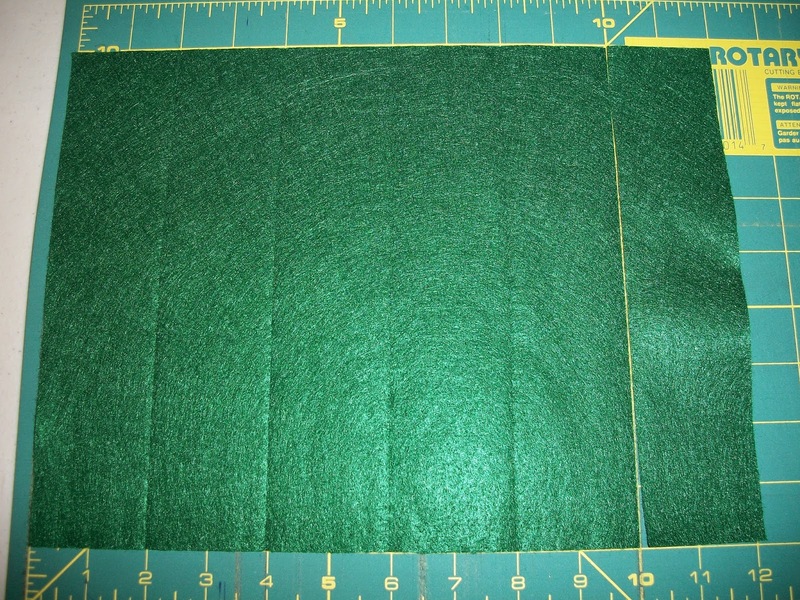 Stitch the green triangles as instructed in the linked tutorial. 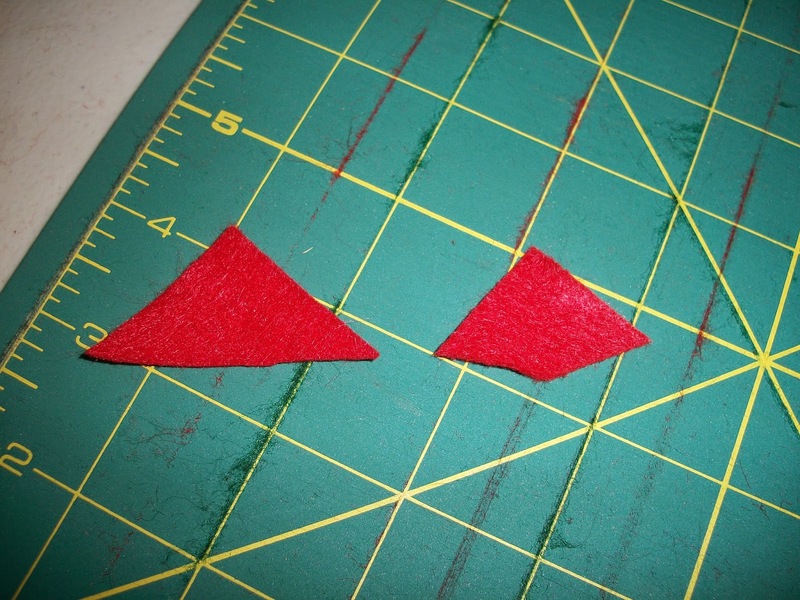 And repeat for the red triangles. 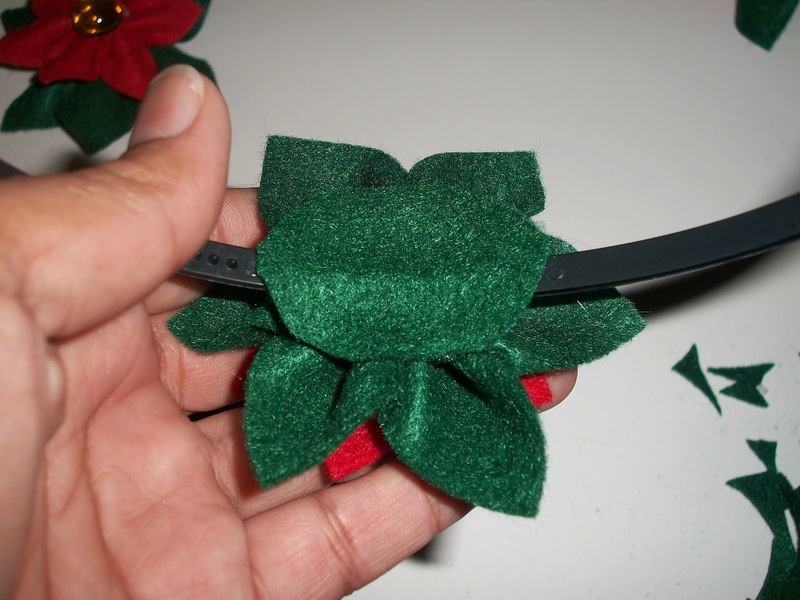 Apply hot glue to the top center circle of the green leaves and attach the red leaves, offsetting them so that the colors alternate. 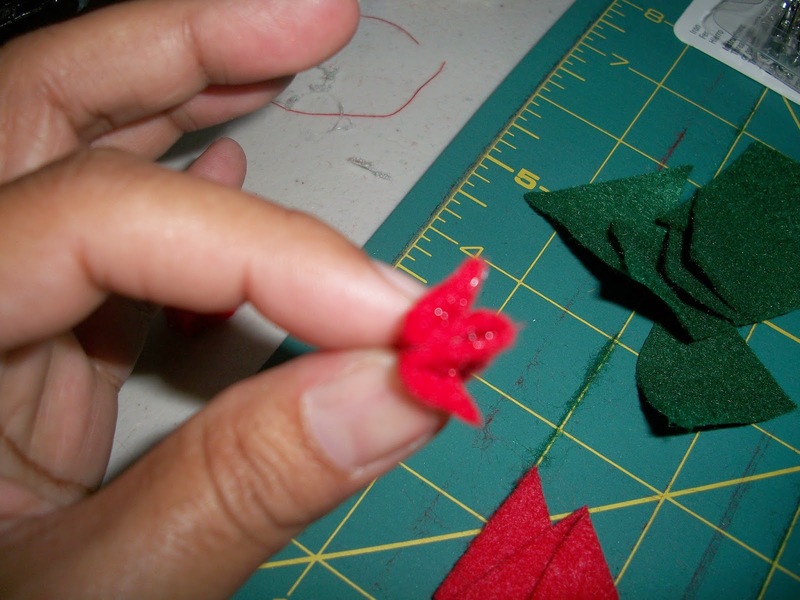 Glue the green felt circle to the bottom of the green leaves, and glue the accent pieces to the top center of the red leaves. 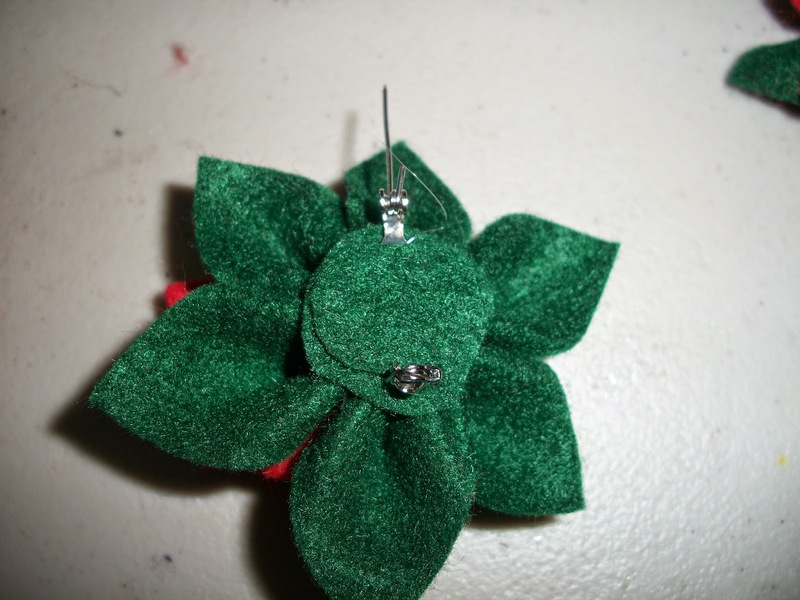 You will need a second felt circle approximately the same size as the one already used on the bottom of the flower. 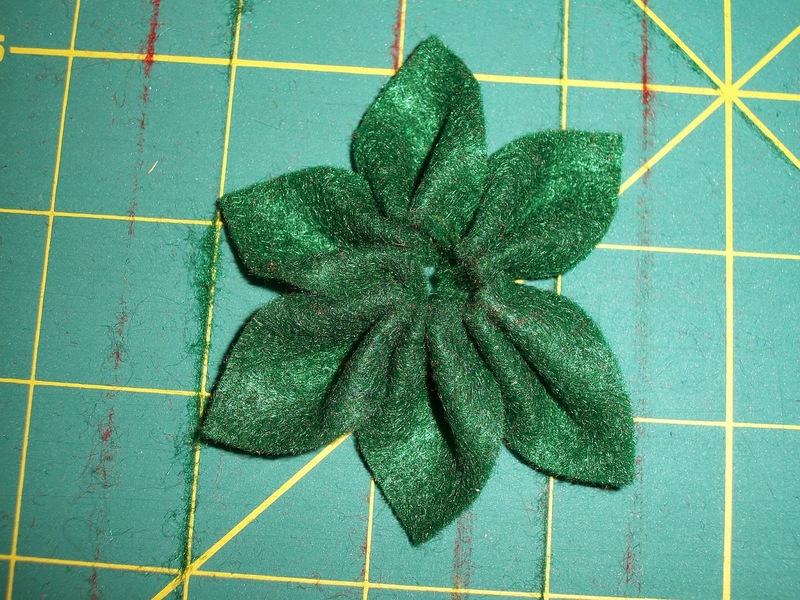 Place a decent amount of hot glue on the felt circle already attached to the bottom of the flower. 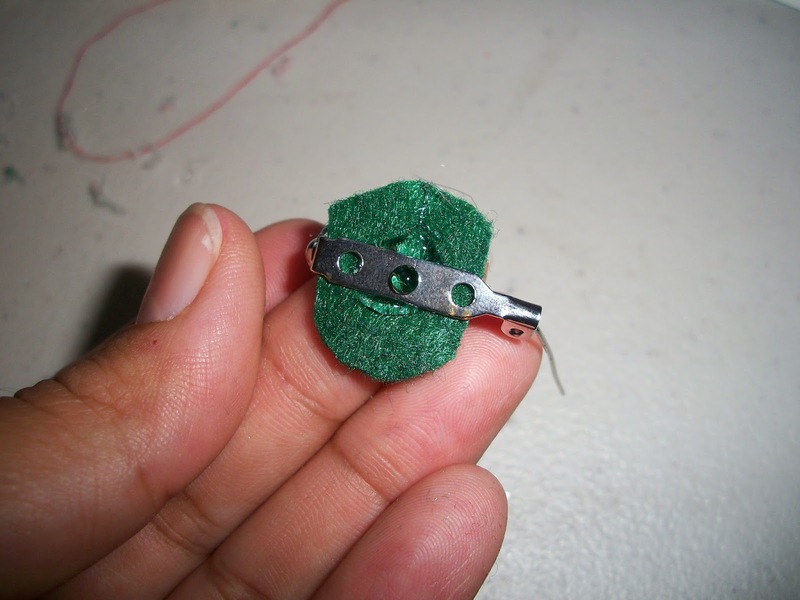 Place pin back into the glue and place the second felt circle over the pin back to help keep it secure when in use. 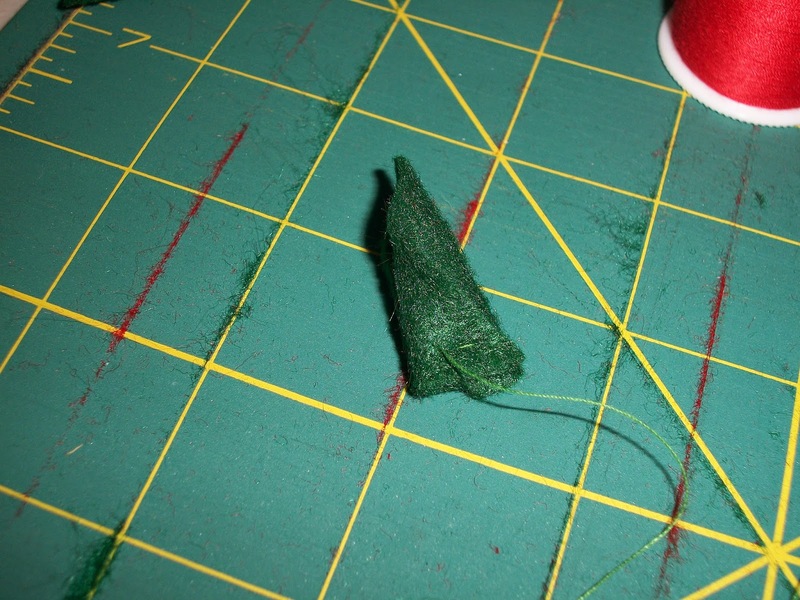 You will need a larger oval felt piece (my pieces were about 1 ¼ - 1 ½” long by about 1” wide). 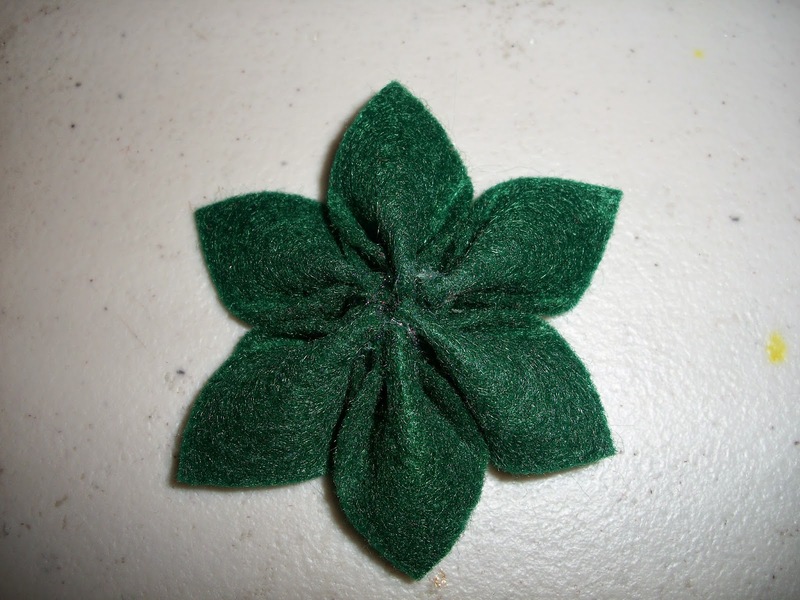 Apply a decent amount of glue to the felt circle at the bottom of the flower. 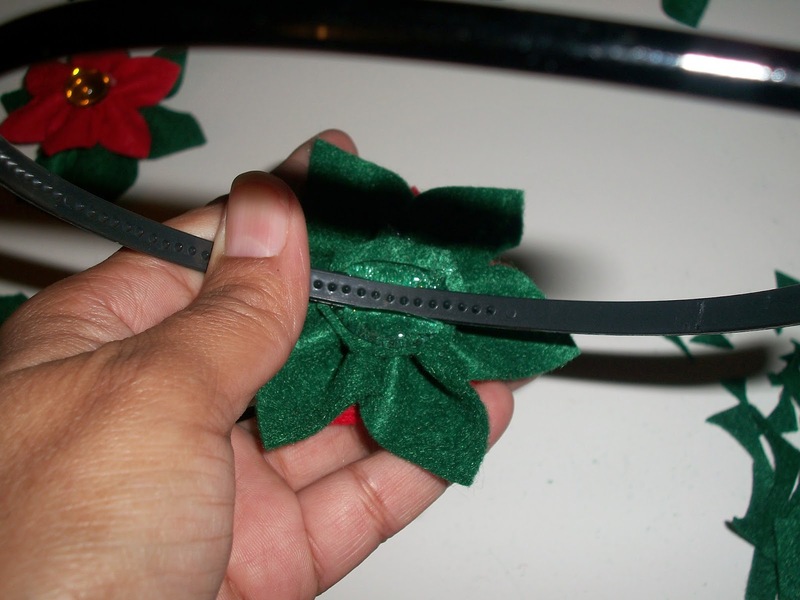 Place headband into the glue and quickly place the felt oval over the headband and press firmly until glue is hard. 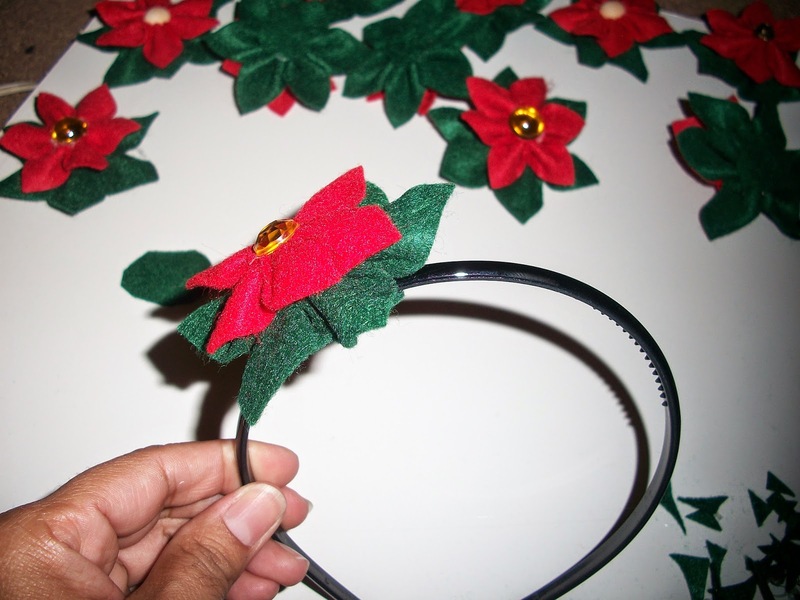 Add glue to headband for the loose areas of the felt oval. 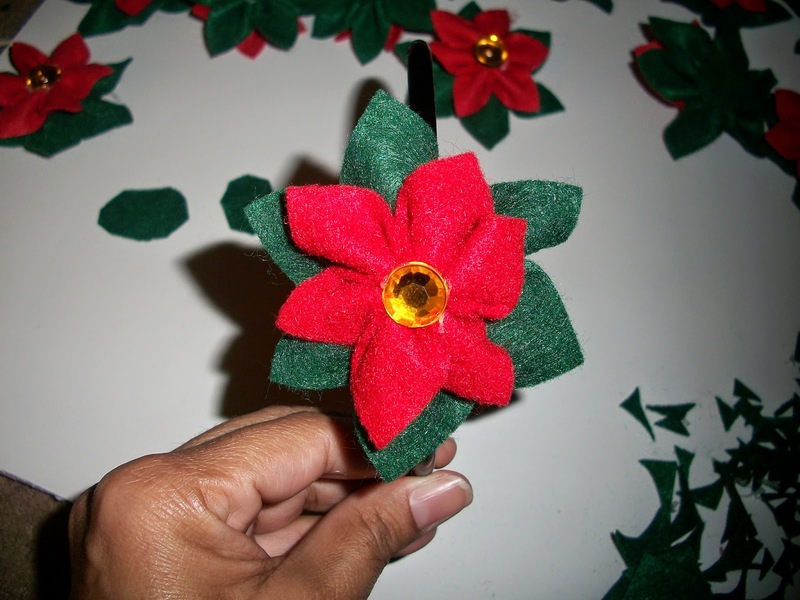 I used a total of 3 green felt sheets and 1 or 2 red felt sheets, and was able to make 20 poinsettias using the sizes in the linked tutorial and listed above. 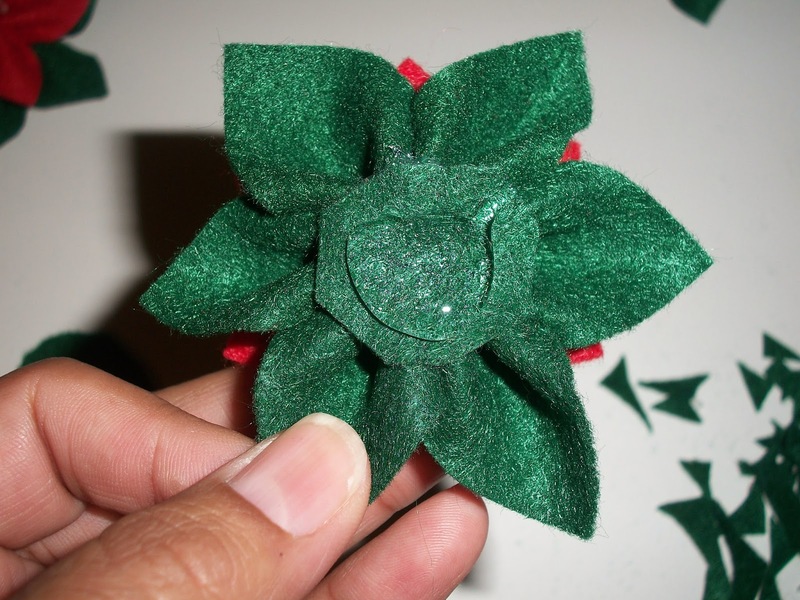 Check back later for more crafty gift ideas for a limited budget.